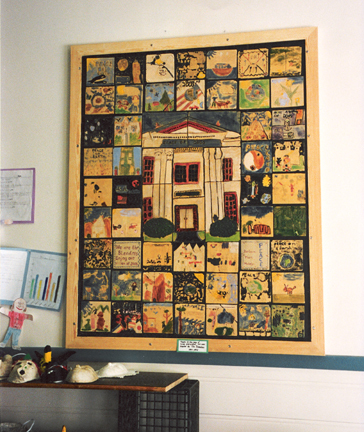 As part of an “Artist in the Schools” project at Lincoln Elementary School in Ashland, Oregon, a 1-5 blended classroom created tiles about the future. The older students, sketched the entrance to the historic school building and created a sculptural central panel with the main school entrance and the stately columns. In concert with the teachers, Susan Springer led discussions about expectations for life in 2005, when the 5th graders would graduate from High School. Designs were drawn and the handmade tiles were handpainted with colorful glazes and fired in the kilns at Illahe Tileworks.